Take a wish list of all the multimedia features you'd want in a phone, then call them the N8. 12 mega-pixel camera for shots that rival dedicated cameras, proper Carl Zeiss optics and Xenon flash, instead of the rubbish lenses and poor LED flashes found on most camera phones. Then add in HD (720p) quality video recording and a separate microphone dedicated to audio capturing crisp sound to accompany all your HD footage. They've even added a HDMI port on the phone; you can pump all that HD footage directly from your phone to your HD TV. Film, edit and perfect your high-definition masterpieces, then share them with the world. Add music, images, text and transitions - all from the phone. With a large 12 MP sensor and Carl Zeiss optics you can capture great images. The Xenon flash allows you to take good pictures in low-light conditions as well. The Nokia N8 features an HDMI connection so you can easily show off your images, videos and music on compatible televisions and projectors. All in stunning high-definition digital 720p resolution. It also features premium-quality Dolby Digital Plus technology - compatible with home theatre systems - so movies will sound as good as they look. Personalise your phone by adding your own widgets. Not one but three live home screens – make one for work, use one for fun, and have one with your favourite picture as the wallpaper. Swipe between the home screens with an easy gesture. Download more widgets from Ovi Store. Voice-guided navigation wherever you are in the world. Absolutely free. Simply enter where you want to go and Ovi Maps with voice guidance will tell you how to get there, turn by turn. By car or on foot. 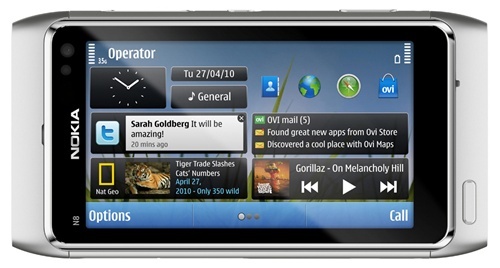 The Nokia N8 with on-demand WebTV. Access your favourite TV channels like CNN and National Geographic and get them piped to your phone from the comfort of your bus seat. Visit Ovi Store to find even more WebTV channels. 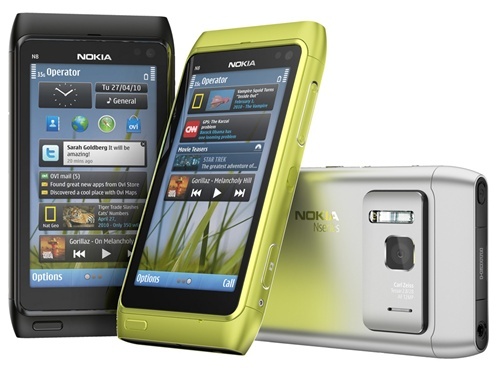 Turn your Nokia N8 into a tool for showing off, having fun and being creative. In Ovi Store you'll find thousands of different applications to constantly upgrade and improve your device. Download apps, games and videos. The possibilities to make your phone smarter, more useful and simply more fun are endless. You can browse smoothly through all your favourite albums and once again get thrilled by the album artwork. Re-experience your record collection for over 50 hours straight.